Elon Musk has a new challenger in the race to colonize Mars. The United Arab Emirates is using its oil wealth to finance a homegrown space program. It plans to launch its first mission to the red planet by 2021, and hopes to settle humans there 99 years from now. The small Gulf state has so far invested 20 billion dirhams ($5.4 billion) in the program, part of a plan to diversify its economy away from oil and gas by developing new areas of expertise. "We want to create our own missions and develop our own satellites," said Salem Humaid AlMarri, assistant director general for science and technology at the Mohammed bin Rashid Space Center in Dubai. The top priority is to send a satellite -- the first built entirely by Arab engineers -- into space by the end of 2018. "KhalifaSat" was developed in Dubai. It was flown this week to South Korea where it will undergo final testing before heading to Japan for launch. The UAE has launched satellites before -- in 2009 and 2013 -- but they were developed with South Korean partners. Back then it was hard to recruit local engineers, AlMarri told CNNMoney. "These days it's easy for us ... we definitely have more inquirers than we have positions available," he said. All 200 employees at the space center are Emirati citizens. 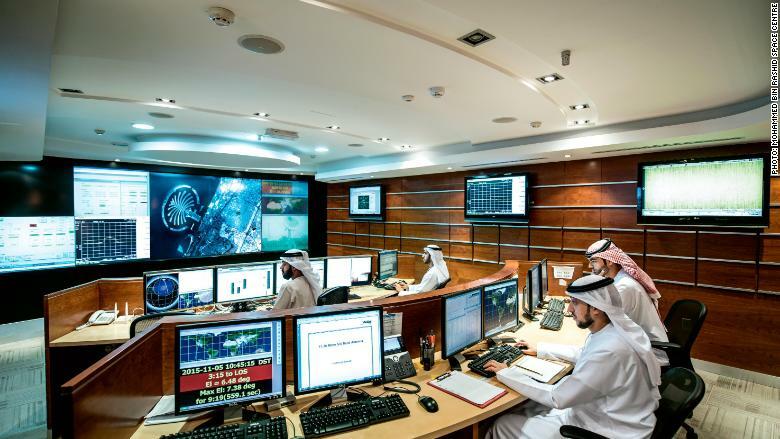 The satellite control room at the Mohammed Bin Rashid Space Centre in Dubai. 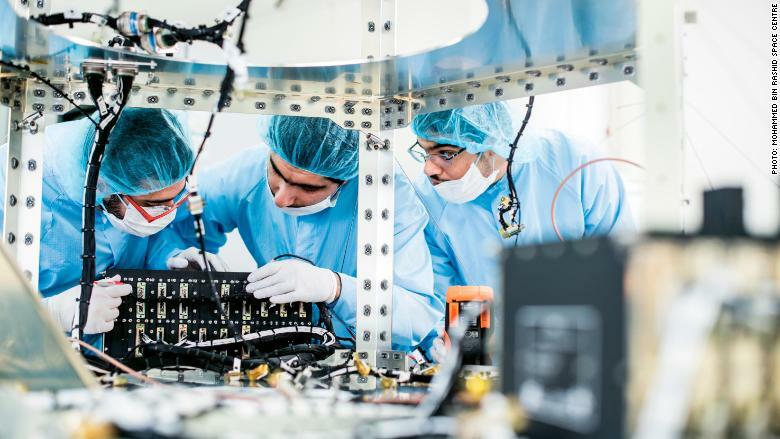 The UAE hopes to become the first Arab state to send a mission to the red planet, by designing, developing, manufacturing and eventually controlling a probe. The country doesn't have its own rocket technology so it will have to rely on companies such as Mitsubishi (MSBHY) or Musk's SpaceX to carry the payload into space. The spacecraft, named "Hope Mars Probe" is set to orbit Mars in 2020, and reach the planet by 2021 to coincide with the 50th anniversary of the founding of the UAE. The project is "on time, on schedule," project manager Omran Sharaf said earlier this week. "Hope Mars Probe" will study the planet's atmosphere at different times of the day and during different seasons. "The data will be available internationally to benefit the whole world," said AlMarri. "We also want to inspire the next generation of Emiratis and get more people to go into science fields." The UAE has bigger ambitions. It wants to build the first human settlement on Mars, starting in 2117. Dubai is already constructing a Mars City to simulate life on the planet, the first phase of which will be completed by 2020. All 200 employees at the space center are Emirati nationals, and many more have applied for astronaut training. The space program is unique to the Arab world and the UAE aims to become a regional hub for space technology. "This region was a strong contributor to society over 1,000 years ago ... It's time that we come back, it's not impossible," said AlMarri. "The UAE is leading by example. We are showing that we can do it." Musk has previously laid out plans to colonize the red planet in 50 to 150 years. 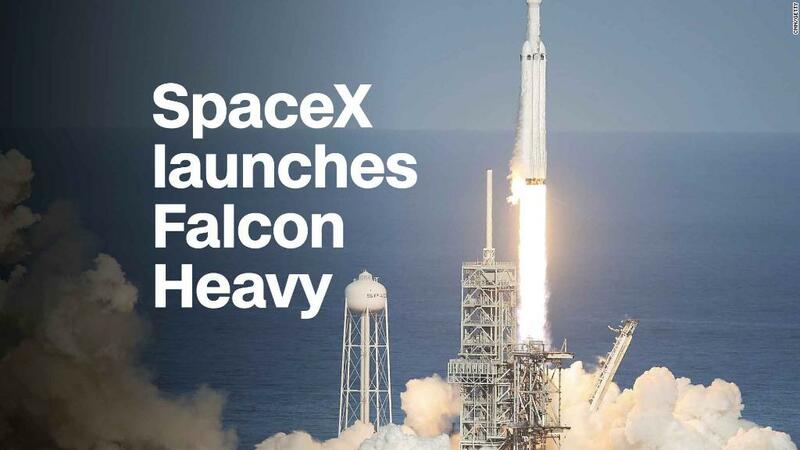 SpaceX captivated the world last week by executing the first launch of its Falcon Heavy rocket. The UAE also wants to send its citizens into space. More than 3,000 people, aged between 17 and 67, have applied for its astronaut program -- 25% are women and the majority are science, technology, engineering or mathematics graduates. Four will be selected and will train for between two and four years. The Dubai space center is talking with NASA, Russia's Roscosmos, the European space agency and private companies about providing training. "Eventually we will look at sending all of those four over the next 10 to 15 years to the International Space Station and beyond on scientific missions that are linked to our scientific objectives," AlMarri said.